by Bill Dwight on Monday, January 26, 2015 at 10:28 PM | LEAVE A COMMENT! Apparently, spending like a pop star finally caught up to “the responsible teen spending company.” Today marked the formal end of the teen prepaid card programs offered by SpendSmart Networks, Inc. and endorsed by none other than teen idol and dubious financial role model, Justin Bieber. Attention: The SpendSmart Prepaid Card program [or the BillMyParents Prepaid MasterCard® card program] is ending and your card will be closed as of 1/26/15. For anyone who’s been following teen prepaid card offerings like I have, the announcement comes as a very predictable end to a very curious branding fiasco. First, consider the original choice of product name. In 2009, just after dumping its unsuccessful American Idol gift card, the company launched a new product intended to “enable parents and young people to link and communicate in order to guide responsible e-commerce transactions on the Internet.” So what’s a natural name for a product designed to encourage responsible financial behavior on behalf of impressionable teens? “Bill My Parents” of course! Hey, why not go all the way and just call it: “Stick It To My Stupid Parents”? Did somebody forget it’s the parents who have to pull the trigger on this purchase, not the teens? Apparently, they skipped the buyer persona step in the marketing process. What normal parent is out there looking for a teen payment solution and thinking: “Gee, I really want my kids sticking me with random expenses!”? I can’t think of one. Then came bizarre branding blunder #2. At the end of 2012, the company decided to fork over the stunning sum of $3.75 million to pop idol Justin Bieber for a 14 month stint as a celebrity spokesperson to represent the BillMyParents card and the company’s mission of instilling teens with responsible spending habits. That’s because, you know, every normal parent is thinking: “Gee, I want my kid to spend just like a pop star!” Not. Apparently, the massive disconnect between branding and mission became pretty evident over time — a long time. The company finally changed the name of their offering (and the company) to SpendSmart in March 2013. But, apparently, it was too little too late. After more than $15 million dollars in wanton spending on sales and marketing expenses, it was finally time to pull the plug. R.I.P. My only regret in the passing of the SpendSmart/BillMyParents teen prepaid card offering is that I will now have to search elsewhere to find humorous fodder for my Finovate demos. Sigh. 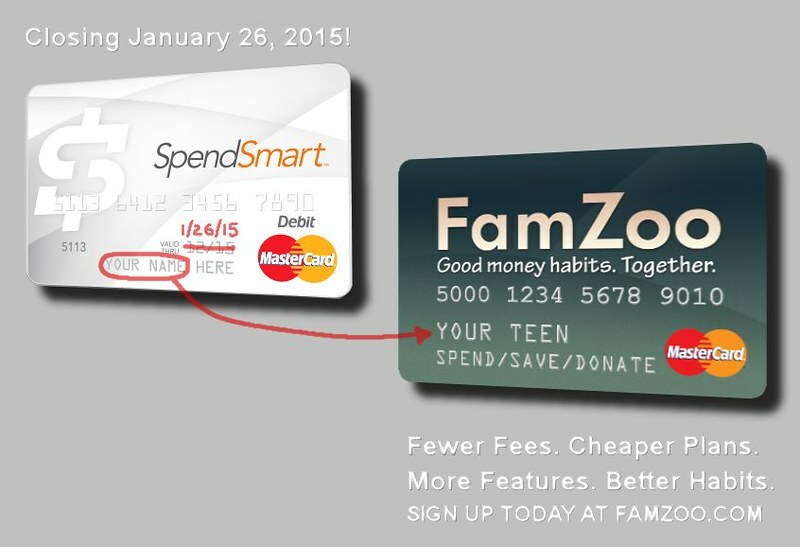 For any parents out there who were left high and dry by the demise of the SpendSmart/BillMyParents teen prepaid cards, I have good news: you can switch over to FamZoo cards right now, and you’ll get more for less. There’s one big catch though: you actually have to be committed to teaching your kid good money habits. we avoid hidden usage fees. The bottom line: our family pack pricing a much better deal, even for a family of just two. Load Fees $0 for first 5 loads from saving or checking, $0.75 after the first 5. 2.95% for loads from a credit or debit card. We have lots of ways to load your card as well as several free ones. Better yet, once you have money on your primary funding card, you can move it instantly to any other card in your family pack for free using the FamZoo app(lication). Inactivity Fee $4.95 per month. $0. An inactivity fee doesn’t seem consistent with teaching your kid to save patiently, does it? ATM Fees $1.50 for a withdrawal, $0.50 for a balance inquiry or decline on top of any ATM operator fees. $0 on top of any ATM operator fees, and you can avoid ATM fees altogether by using one in our network. Card Replacement Fee $4.95. $2 if you’ve already ordered more than 4 cards; otherwise, $0. Card Activity Alerts and Lock/Unlock Card Set up real time email and text alerts to notify family members of card activity and current balance amount. Lock and unlock cards at the parent’s discretion. Ditto. Automated Allowance Payments A minimum of $20 scheduled at the beginning or middle of the month. Delivered to a single card. Any amount delivered any day on a daily, weekly or monthly schedule. The amount can be fixed, a proportion/multiple of your child’s age, or a combo of the two. The amount can be split between card accounts (e.g., different percentages to spending, saving, and giving cards.) More info. Automated Chore Payments N/A You can set up charts defining automated payments for completed chores and odd jobs (or even penalties for when responsibilities are ignored). More info. Parent Paid Interest N/A You can set up parent-paid compound interest to encourage your child to save. More info. Expense Sharing N/A You can set up recurring charges to your kids cards that repay you for a portion of recurring shared expenses — like their share of the family cell phone plan. More info. Automatic IOU Repayment N/A When a family member has insufficient funds for a payment to another family member, we’ll remember the debt and automatically repay it when the funds become available. For parents, that means you’ll never forget to pay your kids’ allowances again, even if your primary funding card runs dry for a while. More info. Reimbursements and Money Requests N/A We automate and track common money interactions between family members, like requesting funds from a parent or seeking reimbursement for a specific purchase. Loan Tracking and Repayment N/A We provide the tools you need to record and track informal loans between family members. More info. That’s just a taste. To learn more about our ever-growing list of features designed to encourage good money habits, check out our FAQ. Unfortunately, we’re admittedly weak in the celebrity endorsement category. In lieu of a lavishly compensated Justin Bieber, all we have to offer is Thrif T. Tiger and a mission-driven company run by two dads truly dedicated to helping families develop good money habits. We’d be delighted to serve your family.